As we come to the end of another very busy and innovative year, we are delighted to look back and see that our integrated approach to climate and development has been acknowledged through a series of prestigious awards, including those from Guardian Sustainable Business, Environmental Finance and Carbon Trading. More importantly our approach has been endorsed by our clients and partners. Our expertise and innovation continues to be in demand, shaping thinking with Governments, NGOs and International Businesses, as we help to bring these bodies together to work in partnership. We have expanded our team, strengthening our expertise in many areas, across project development, marketing, PR and strategic development. We are also delighted to have expanded our network of partners and very much look forward to working with you all over the coming year. However it’s not all good news. This sobering report from the World Bank reminds us why it is so important that we all take full responsibility for our climate impacts and support direct action in projects that not only mitigate climate change, but provide vital adaption outcomes and help alleviate poverty and improve health in the communities that will be most affected. If anyone is in any doubt of just how urgent or important this work is, please do read the above report – setting out the stark consequences of a 4 degree temperature rise. Against this backdrop of urgency, a lack of clear direction from talks in Doha remind us how difficult it is to bring countries together to achieve the holy grail of ‘International Agreement’. This highlights the importance of taking action over and above what we are ‘forced’ to do by Government and reinforcing the value of our work with forward thinking individuals and organisations, who are taking action now. If you haven’t quite met your 2012 carbon reduction targets, or you want to take full responsibility for your environmental impacts, remember that you can still cut global carbon emissions and improve people’s lives by offsetting your residual emissions with our climate and development projects. Please call us now on +44(0)1865 591000 or +254 (0)20 213 3604 to discuss how we can work together. Please note that the ClimateCare offices are closed from 22 December 2012 – 1 January inclusive. Following a multitude of awards this year, including for Social Innovation, Global Health, Environmental Finance and Innovation, Carbon for Water recently got a thumbs up from The Guardian Newspaper, in an article Straw poll finds in favour of western Kenya’s water and carbon solution. The project was also acknowledged by the UNFCCC as one of just nine lighthouse projects selected to showcase how climate change activities bring social and environmental benefits in developing countries. This world first project is providing safe water to 4.5 million people, cutting carbon and changing the way we think about climate and development. Contact us now on +44(0)1865 591000 for short term price offers and to find out how you can support this and similar projects. ClimateCare Director Edward Hanrahan was recently Business Fights Poverty member of the week, and used the opportunity to highlight the importance of governments, business and NGOs working together to tackle the challenges of poverty, health and climate change. If you missed this article, read it here. In addition, the 2 degrees network ran an article about the ClimateCare approach, describing our way of working as a Smart business approach to sustainable developmet and highlighting Carbon for Water as a great example. We’d love to hear from partners who are interested in working with us – businesses, NGOs and public sector. Email business@climatecare.org, or call us on +44(0)1865 591000. We were delighted that our partners and clients chose to vote us winners of all three categories we were eligible for in the prestigious Carbon Trading Magazine survey. Thank you to everyone who voted for us. See the rest of the rankings in the full Carbon Trading article on our website. 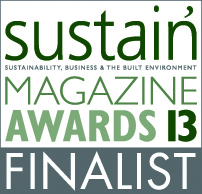 We have also been shortlisted for the sustain’ Magazine Awards. “The sustain’ Magazine Awards 2013 has seen an extremely high-calibre of entrants demonstrating best practice in sustainability. It is an amazing achievement for ClimateCare to be shortlisted in the face of such strong competition.” said Steve Oxley, Editor of Sustain Magazine. This entry was posted in News and tagged climate, climate impacts, environment on by .